Faced with higher costs for pensions and materials, Ford Motor (F) earnings are expected to be weaker next year compared to 2010, according to a research note released Wednesday by Credit Suisse Securities. "To the extent that Ford has been a great earnings momentum story, it will be difficult, in our view, for the shares to push higher in the face of declining earnings," said research analyst Christopher Ceraso in the report. Further, Ceraso says, that higher costs "should outweigh a stronger profit contribution from higher production volume in North America," according The Detroit News. Credit Suisse forecasts call for pretax income from Ford's North America operations to fall to $4.2 billion in 2011 from $4.8 billion this year. Ceraso also anticipates Ford's financing arm, Ford Credit, will be less profitable in 2011, having benefited this year from higher residual values on returned leased vehicles and record-low credit losses. The finance unit is expected to earn pretax income of $2 billion next year, down from $2.7 billion in 2010. Higher pension costs are being driven by falling yields among high-grade bonds, causing discount rates for pensions to tumble as well. 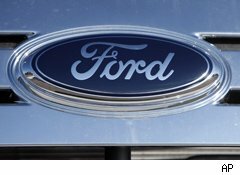 If discount rates don't improve, Ceraso said, Ford's earnings-per-share could be shaved by 15 cents to 20 cents a share. Cash contributions could also move higher next year, with Ford contributing as much as $2.7 billion to its global pension plans, compared to $1.5 billion in 2010. Ford pension plans worldwide were underfunded by about $12 billion at the end of 2009. "We estimate that funded status could deteriorate a further $5.5 billion, to about $17.5 billion underfunded at year-end 2010," said Ceraso, who rates Ford's shares at underperform and has an $11 price target on the stock. "Based on rising structural and material costs, we are already forecasting an earnings decline in 2011," Ceraso said, adding that rising pension costs could lower the bank's estimate of Ford's annual EPS from its current target of $1.40. For 2010, Credit Suisse estimates Ford will earn $1.71 a share. Shares of the No. 2 U.S. automaker fell 2% on the New York Stock Exchange after release of the report. So far this year, Ford shares have gained 23% in value.